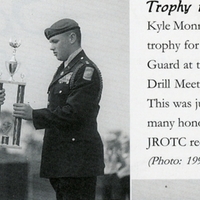 Lyman High School cadet, Kyle Monroe, accepted a trophy for his school's Junior Reserve Officers' Training Corps (JROTC) Color Guard at the Army State Drill Meet held at George W. Jenkins High School, located at 6000 Lakeland Highlands Road in Lakeland, Florida, in 1998. Jenkins High School is a Polk County Public School founded in 1993 to relieve overcrowding at Lakeland High School and Bartow High School. The school is named after George Washington Jenkins, Jr., the founder of Public Super Markets, Inc.
Lyman High School is a Seminole County Public School located in Longwood, Florida. In 1923, a board of trustees agreed to construct a new school to accommodate the growing population in the Longwood and Altamonte Springs area. Construction began at 1725 County Road 427 in 1924 and opened in September 1924 with Professor Howard Douglas as its first principal. Lyman School, as it was originally called, was named after Howard Charles Lyman, a citizen who was active in planning the school's establishment, but died a few days before construction began. In just two years, Lyman became an accredited junior high school and its campus had been expanded with six rooms. With W. J. Wells as principal, the Lyman School achieved accreditation through 12th grade in 1929. In 1963, the school was renamed Lyman High School when it became an accredited institution with Carlton D. Henley as principal. In 1966, Lyman High became integrated with both white and black students. A new campus was constructed at 865 South Ronald Reagan Boulevard in 1969 and the original campus became R. T. Milwee Junior High School. Milwee was named after Rayburn T. Milwee, Sr., who taught at Lyman from 1939 to 1949, served as principal from 1949 to 1952, and finally as Superintendent of Seminole County Schools from 1952 to 1967. In 1970, Seminole County transitioned from the junior high school system to the middle school system, causing Lyman High School to now accommodate ninth grader in addition to 10th, 11th, and 12th graders. During the transition period from 1970 to 1971, the school mandated "double sessions" in which half of the school would attend from 7:00 am to 1:30 pm and the other half would attend from 11:30 am to 6:00 pm. In June of 1971, Milwee Middle school, where Lyman's original campus was, closed and reopened as a satellite campus for Lyman High School during the 1971-1972 school year. For the 1972-1973 academic year, all Lyman students returned to the primary campus and the satellite campus was used for Lake Brantley High School instead. In 2000, Lyman established the Institute for Engineering, a magnet program emphasizing mathematics and science. Original black and white photograph by Greyhound Staff of 1999, 1998. 4 x 3 inch print reproduction of original black and white photograph by Greyhound Staff of 1999, 1998: Greyhound 1999, (Longwood, FL: Lyman High School, 1999): Seminole County Public Schools Collection, UCF Public History Center, Sanford, Florida. Digital reproduction of 4 x 3 inch print reproduction of black and white photograph by Greyhound Staff of 1999, 1998. Greyhound 1999, (Longwood, FL: Lyman High School, 1999): Seminole County Public Schools Collection, UCF Public History Center, Sanford, Florida. Copyright to this resource is held by Lyman High School and is provided here by RICHES of Central Florida for educational purposes only. "The History of Lyman High School." Lyman High School Classes of 1975 & 1976. http://www.lyman7576.com/history.html. "Lyman High School's Namesake." Lyman High Class of 1970. http://www.lymanhigh.org/lymanhistory.html. "Lyman History." Lyman High School, Seminole County Public Schools. http://lyman.scps.k12.fl.us/Parents/ParentsAH/HistoryofLyman.aspx. Central Florida Society for Historical Preservation. Longwood. Charleston, SC: Arcadia, 2001. "JROTC Today," Army Junior Reserve Officers Training Corps, United States Army, United States Armed Forces. http://www.usarmyjrotc.com/. "George Jenkins High School." George Jenkins High School. http://georgejenkinshs.com/. Trophy time. Cadet Kyle Monroe accepts a trophy for Lyman's Color Guard at the Army State Drill Meet in Lakeland. This was just one of the many honors that Lyman's JROTC received. Greyhound Staff of 1999. 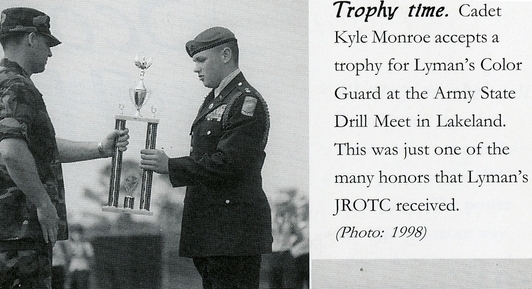 “Lyman High School Cadet Kyle Monroe.” RICHES of Central Florida accessed April 22, 2019, https://richesmi.cah.ucf.edu/omeka/items/show/2806.